The Lunar Chronicles is a must read if you like science fiction. It's also a must read if you don't like science fiction. Every book features strong girls, hot guys, and lots of action. Plus a fairy tale retelling! What more could you want? Cress continues the streak of high quality. I listened to Cress on audio. The narration was great and it was easy to follow the story. The problem is, my interest in audio books waxes and wanes. So it actually took me four or five months to finish this book. I listened to the beginning around April, a little more in May, and more than fifty percent on Thursday and Friday. Impressively, I did not have any problem picking the story back up despite the long breaks. This is a compliment to the story, not to my memory - which for most books, is very poor. A lot of reviewers have complained that Cress is weak compared to Scarlet and Cinder. That's true in a way, but is much more a factor of her childhood. Scarlet was a pilot. Cinder was a mechanic. Cress was stuck as a prisoner, alone in a spaceship, for years. Admittedly, Cinder was a prisoner of a different sort and is a more outwardly strong character, but Cress is rebellious in her own way. Cress also seems weak, because she has all these idealized visions of a prince coming to rescue her and having a HEA. That again is a product of her upbringing. Cress has been so isolated. Her only "friends" are the net dramas she watches, which presumably are like soap operas. That's her only conception of real life. So of course she imagines it do be like fiction. Cress became strong over the course of this book. She went from expecting Thorne to be everything for her to being someone that Thorne needed to survive. They became a team of equals. She doesn't have the self confidence of the others, but she has a quiet persistence that gets things done. I felt like this was more of a three part book than Scarlet. Cress was not really the main character. Scarlet, Cress, Cinder - and Kai (so four parts) were given equal time. Scarlet probably got the least amount of time, but that's fine since Cinder and Kai's story is what interests me most. The book flows well, despite telling so many different stories. In fact, I think it's a benefit. Whenever I thought I was getting tired of one story line, another one showed up. Don't worry about lack of action because Cress is not as outwardly strong as the others. Each of the characters has numerous instances where they have to fight for their lives. The book is consistently exciting. I listened to about 10 hours of the book on Friday (on triple speed) because I couldn't put it down. That meant multiple walks for the dog and lots of Tetris games for me. 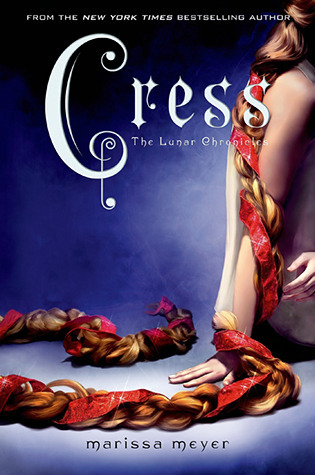 If you enjoyed Cinder and Scarlet, you will like Cress just as much. The book sets everything up for Winter. I can't wait to read the next book to get to live in this world a little longer. "That's true in a way, but is much more a factor of her childhood." - that's a good point! She's not as Scarlet or Cinder, but she does prove herself a few times. Amen and amen! It's a worthy sequel to the other books. I love how it introduces intriguing new characters, but also lets us keep up with our old favorites. Great book, great series. I totally have to read this book. I read the first two but have fallen away from it. I really enjoyed this book. It was nice to get lost in their world for a while. While Wolf still has my heart, Thorne is close second. I'm really excited for Winter. She is going to be a really interesting character. I have to agree with what you said about reading it if you like sci-fi AND reading it if you don't like sci-fi!!! YES! I am trying to convince my sister to read this right now and she doesn't really want to because she thinks it's going to be a sci-fi book. I am like noooo read it! You can get distinctive brandnames and even type an important magical individual sit back and watch included in that cartier replica. A number of top notch brand names and even and brandnames contain a number of an important magical individual sit back and watch within their standing. A lot of a lot of these running watches check to somewhat of a aluminum sit back and watch, additionally, the ‘Citizen AP1011-58A Men’s Watch’, can be in force and also the the exact same. Most people will just who get it sit back and watch possessed a fairly good go through in such a sit back and watch. Nearly all owners contain recorded some people enjoy Homeowner AP1011-58A considering a lot of these running watches can be eco dependable & the substances including parts of potential -- the sun's solar battery contains product everyday life around two decades nevertheless additionally there is a powerful gauge in fake watches belonging to the celestial body overhead, time in seven days, meeting, . . .., yet nevertheless they are really water-proof and even economical rate. Should you want Magical tone running watches then simply it sit back and watch was obviously a appropriate fitted to one considering Homeowner AP1011-58A contains magical face through black colored tone Roman rolex replica. These have stainless steel court case and even gold through dimension in 38mm while not top. Through 100 meter liquid prevention and even anti-reflective nothing invulnerable nutrient tumbler gemstone, you won't ever demand solar battery because functions at potential rolex replica. Some running watches is definitely the Ion Sporting Gold sit back and watch. When you're inside sporting and even exercise routines, then simply this really is be familiar with apparatus which you want onto your arm if you end up cartier replica in good physical shape.